December | 2014 | We Can't Hear the Mime! It’s now been a phenomenally long time since the first Hobbit film was released. So long ago in fact that I did not have a blog at that time. However, to hear my thoughts on The Hobbit: The Desolation of Smaug, please go here since I don’t want to repeat myself too much here. I stand by the point that everyone has been agreed on for three years, these films should not exist, at least not in their nine-hour three film format. Nevertheless they do. I have no idea what it would be like to watch all three films in a row, since one thing both the second and third have done well is catch you up to the plot in the first ten minutes. This is the most concise the films ever get so enjoy those ten minutes. Battle of Five Armies starts pretty badly, as the great three year threat of Smaug is killed off in near enough the blink of an eye and you’re left wondering where this film could possibly go with the three chapters that remain. I don’t know how much has been added to this film, apart from Legolas and Tauriel. I’m not a Tolkien fanatic and it’s been many years since I read the Hobbit, since I read this children’s book when I was in fact a child. What the film shows us is one very extended battle, with strategy from all sides and every skirmish played out in full. This gives Orlando Bloom an opportunity to leap on falling rocks in a way no one has done since early 2000’s video games. There’s an overall impression of glitz and falseness that hangs over the CGI nightmare as ever. Yet Jackson does know how to pull an audience along with him. Despite a year of not so much as thinking about the Hobbit characters I found myself deeply invested, even in the invented love triangle that has got so much hate. 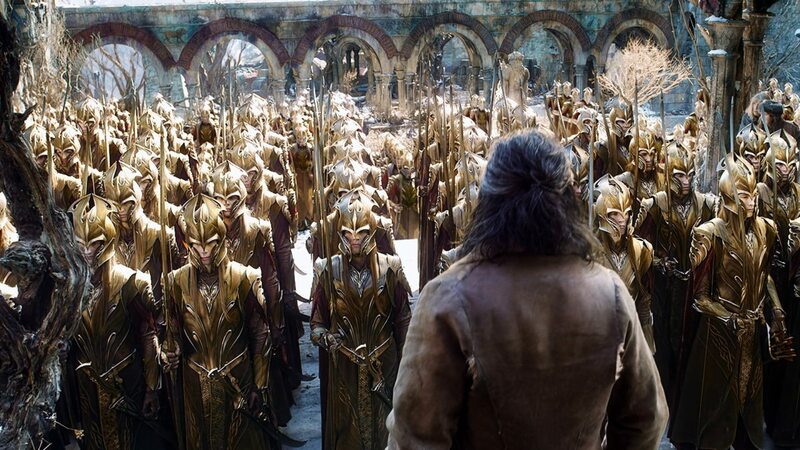 It almost feels as if Peter Jackson was fighting with himself through these films. Part of him decided to make three three-hour films and then he spent the rest of the time trying to make up for this horrible decision. Some of the things that get stuffed in don’t fit, a psychedelic set piece showing Thorin melting in a river of gold is unwanted at best and a cutaway to Legolas and Tauriel discussing war bats is laughable. The Hobbit is like comfort food for those who love Middle Earth. There are no surprises, no great shocks. The characters develop a little and in predictable and comfortable ways. Hints are thrown in to push this towards the Lord of the Rings trilogy and it seems like a nice, safe and consumable piece of Middle Earth history. This is partly because of the lack of reality caused by the style. Wen you can sense that none of this exists just by looking at it the deaths lose their brutality, the battle stakes go down and it’s just an aesthetic experience. The interplay of shapes and colours and cinematography never falters throughout Battle of Five Armies and it’s a really enjoyable, immersive experience, if not a very substantial one. This entry was posted in Film Reviews and tagged Battle of Five Armies, Film Review, Martin Freeman, Middle Earth, Orlando Bloom, Peter Jackson, Richard Armitage, The Hobbit, Tolkien on December 31, 2014 by Flo. Christmas time has come round again and following on from last year’s review of Love Actually I would like to once again review one of my personal christmas favourites, even if it may not be well-loved by many. Having already directed Rain Man and Good Morning Vietnam Barry Levinson set off to direct the markedly less successful Toys. Toys is a film that demands a suspension of disbelief more heightened than one is ever accustomed to. Set in the forcibly whimsical world of Zevo’s toy factory and the equally whimsical pop-up mansion the protagonists inhabit, the film loiters in a timeless void, a story that could be just as easily set in the 50’s as the modern day. The story unfolds like a modern-day fairytale, dynastic struggles, good Vs evil and innocence in the face of war. Many people have considered this an anti-war film, which, given that the film finishes in a final battle stand-off opens an easy route to crying hypocrisy. While the film has a lot to say about war, it’s not that it shouldn’t exist. More than anything it admits the presence of war, but demands that we protect children from it, and that we do not fight without just motivation. Of course, what constitutes just isn’t really the place of a Barry Levinson film to decide but it can set the ball rolling in terms of thinking about it. There are confused elements within the film. While clearly the new security guards and tight factory regulations introduced by the General (Michael Gambon, in a splendidly funny turn) are meant to be the forces of evil (they subtly bear a ZZ symbol on their collars) the status quo we are introduced to seems equally post-apocalyptic. In enforced pastel colours groups of workers perform repetitive tasks day after day while convinced that they have “the perfect job”. I don’t know what the happy medium between this marxist pastel nightmare and the police state enforced by the general is but there has to be one. In the end it does seem like they might be on their way, with a few concessions being made to the general in the closing montage but the idea of the factory returning to how it was is not entirely comforting for anyone apart from the anthropomorphised toys themselves. The performances in this film tend towards pantomime, since the script doesn’t allow much three-dimensional character development, notably true for Alsatia, whose character is so entirely two-dimensional that she dresses herself as a paper doll. This does get justified in perhaps the strangest and least explained plot twist (apart from the strange capacity of Michael Gambon to spawn a black son) but I guess Joan Cusack does acquit herself quite well given the bizarre demands of the script. LL Cool J, who I know of exclusively from this film and was somewhat surprised to find is a rap artist, plays his part very well but serves almost exclusively as comic relief. The two who manage to get out of stereotypes in their performance are Robin Williams and Robin Wright who act as the romantic sideplot with Wright as a perfect foil to William’s humour. They’re great performances and really sell the heart of this odd, sweet little film. Hoping that everyone had a Merry Christmas and wishing you a Happy New Year from We Can’t Hear the Mime. This entry was posted in Film Reviews, Personal Screen and tagged Barry Levinson, Christmas, Christmas Review, Closing of the Year, Joan Cusack, LL Cool J, Michael Gambon, Robin Williams, Robin Wright, Toys on December 26, 2014 by Flo.